Audio Thoughts: Amanda Ronconi is perfect for Molly’s humor and she does a fantastic job. Jonathon brings the perfect level of growly male to really hook you. They both did a fantastic job and it was a fun listen! 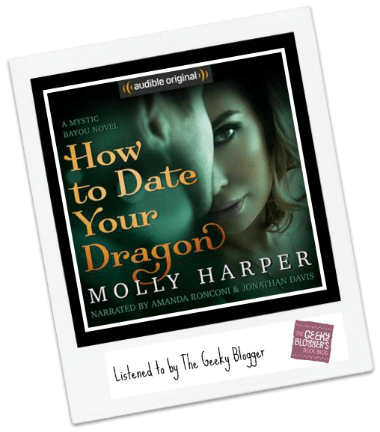 Felicia gives her #LoveAudiobooks Review of How to Date Your Dragon by Molly Harper/Narrated by Amanda Ronconi --go see what she thinks! I am so glad I grabbed this one Flea. I had only ever tried a novella and it was just ok. I like the world and thing the dual narrators paid off! I can’t believe I still haven’t read this! I love Molly Harper and agree, Amanda Ronconi is perfect for her snarky humor. I’ve had this on my to read list for a couple months now :/ Glad you enjoyed it! The title had me concerned at first. I guess my brain just went to a person dating a dragon NOT a person who can turn INTO a dragon. LOL! My brain today….but yessss this sounds good! I am going to have to give this a go. I need something fun and snarky. Molly Harper tends to write funny stuff, though I was a bit disappointed in her Sweet Tea book. I haven’t read anything by her in so long but I always love her humor! As you know – I’m still struggling with the audio thing lol but I might like the dual narrator thing because one of my issues with the last book was the girl doing the guys voice. Loved this! It was different for me to listen to a duet but it really wasn’t as confusing as I thought it would be. Love Zed, he’s going to be quite the character! I still need to try this one, just not in a romance mood, but I do love this series!